Account-Based Ticketing is a ticketless way of allowing people to travel, meaning they tap or scan using a secure token, linked to an account in the back office, to make a journey. The amount of taps and location of these taps calculates the fare, which is charged to the passenger post journey. This means riders do not need to buy a ticket and can benefit from best fare policies. Having an account does not make a system account-based and if you need to purchase a ticket before traveling you can be pretty sure it is not account-based. That is not to say you can't operate both account-based and pre-purchase ticketing. In fact, we would recommend both are available for different use cases, as they are through the Justride platform . Thanks to the advances in speed of internet services and the near ubiquitous levels of smartphone and contactless credit/debit cards adoption (in some regions), transport providers are launching new transit ticketing systems that remove the need for passengers to buy a ticket before boarding, while giving them the flexibility to choose their preferred method of payment for transit, whether that be a mobile phone, contactless card, wearable, or other ID to travel. These Account-Based Ticketing (ABT) systems allow transport providers to move away from older closed ticket systems and the cost of issuing proprietary paper, smartcards and magstripe tickets and handling cash. ABT systems enable passengers to travel seamlessly without needing to navigate the complexity of pre-purchasing a ticket, using a ticket vending machine, standing in line to buy a paper based ticket, or topping up a smartcard. Traditional fare payment systems allow passengers to add value to mag-stripe cards or smartcards or purchase passes before traveling. With ABT, passengers can simply tap their preferred fare media upon boarding (and alighting) the transit system. Fares are then calculated and payment processed (after their journey has taken place) by the back-office. Masabi's Justride Platform is account based and supports multiple tokens assigned to a back office account, so passengers no longer need to buy a ticket before traveling. 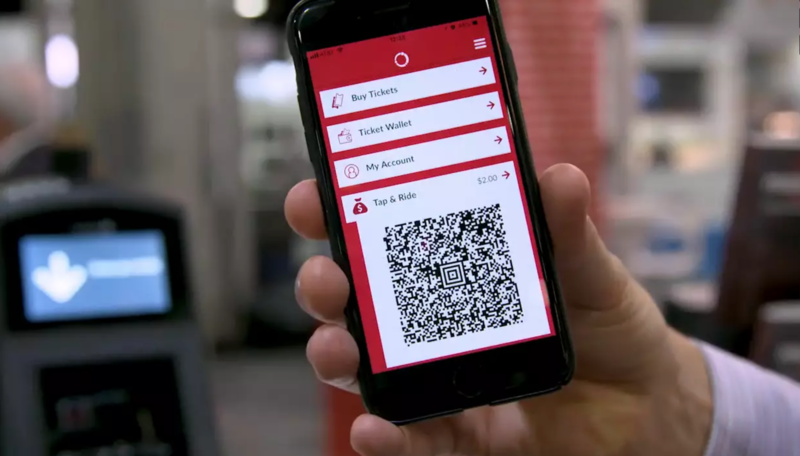 In addition to mobile barcode tickets, the multi-format platform facilitates the use of a variety of fare media, including: agency issued smartcards, paper barcode and c-EMV (contactless credit cards). Agencies no longer need to spend hundreds of millions on a new fare collection system to deliver the benefits of account-based ticketing to their passengers. There is no need to purchase a ticket when you have an account. Simply tap (scan) using a mobile barcode, or use another token such as smartcard, contactless credit/debit card or virtual EMV token. This takes the complexity out of riding transit, making it easier for passengers to just ride. A passenger can use the token most suited to their needs or preferences, whether that be a barcode generated from their phone, c-EMV, Smartcard or Virtual EMV token. With Account-Based Ticketing passengers just tap (scan) and ride. Because the system works by associating taps to a rider’s account and then calculating the fare based on those taps. Agencies can then implement rules enabling best-priced fares for riders like fare-capping. ABT enables the quick implementation of transfer rules for different modes of transit, such as discounted fares when continuing journeys from subway to bus. The Justride ABT platform can accommodate flat, time based, zonal based, distance based fares and more. Concessions can be enabled through the Justride back office, or via the Justride web portal or client websites, permitting / restricting access to entitlements on an account-by-account basis. For those users entitled to reduced fares, Justride is able to calculate their fares after they have ridden or Justride can expose the ability to purchase reduced fare tickets to permissioned riders in advance of their journey, taking into account the proper discounts based in their rider category (students, retired, operator employee, etc). Fare calculations are processed in the back office instead of on the validation unit. This means that the passenger’s fare media is merely a token representing that the account which it is registered to is in good standing. This also means the system is easier to maintain as it is a single back office instead of a network of locally-hosted devices each of which require maintenance. Because the fare logic is managed and calculated in the back-office, there is no logic in the hardware. This means that the system can be updated quickly from a central location and is able to meet the evolution of technology - instead of a system that rapidly leaves transit agencies managing an out of date system that is costly to maintain and replace. Deploying ABT, which by its nature is easier to upgrade than legacy systems, with a provider that, for over 10 years and through over 30 deployments, has prioritized open architecture and built cloud-hosted technology that utilizes commercial-off-the-shelf hardware, sets the Justride platform apart in its ability to meet the ever-changing pace of technological innovation. The system is run from the cloud via Amazon Web Service meaning it can be deployed quickly and cost-effectively around the globe. In addition to leveraging AWS, Masabi also leverages commercial-off-the-shelf hardware, meaning agencies aren’t locked into expensive proprietary closed-architecture systems. Because Justride is a Software-as-a-Service (SaaS) platform, any update to the system benefits all customers around the globe, meaning it is constantly evolving, improving and adding functionality. Account-based systems are transparent: a passenger easily knows how much value they have in their account and can manage and update their account credentials. Masabi’s Justride ABT platform goes one step further, it is a mobile-first account-based platform designed to allow passengers to manage their account right from their smartphone, all of which is PCI DSS certified and backed up by a range services that ensure security throughout the platform. Masabi’s cloud-based platform, Justride, unifies account-based and pre-pay ticketing into a single configurable solution, enabling agencies to deploy a future-proof specialist transit payments platform allowing passengers to just ride. The multi-format platform facilitates the use of a variety of fare media including; mobile tickets, contactless credit cards, smartcard, paper barcode and more. Once deployed, other transportation and best-of-breed services can be added; building a MaaS (Mobility-as-a-Service) offering with the public transit agency at its core. Tickets can be sold via branded apps, web portals or SDKs integrated into 3rd party services; all linked together through the Justride back office. Wherever agencies are on the path to BYOT (Bring Your Own Ticket), Masabi’s ‘Mobile First’ approach enables organisations to take the first step towards growing capabilities in a modular process; saving money, reducing risk and increasing operational efficiency.